On Friday, November 21, 2014 SUNY College at Old Westbury graduate students in the Masters in Teaching English program traveled to Washington, D.C. to attend the 104th National Council of Teachers of English Annual Convention, “Story as the Landscape of Knowing,” at which over 7,000 K-16 English teachers met to “examine the power of story as the landscape within which we map the significance of experience and build towers of knowledge.” As NCTE has said, “Stories saturate our lives, woven so tightly into the fabric of the everyday that it’s easy to overlook their value as a way of knowing the world. They are the glue that creates community and binds us together around common purposes and values.” At SUNY Old Westbury, our students also create community through story telling by analyzing great works of literature, writing critical reflection and research papers, and creating innovative curricula. At the 2014 NCTE Annual Convention, three of our SUNY College at Old Westbury students had the opportunity to share their stories with the national professional community of English teachers. As NCTE president and Columbia University professor, Dr. Ernest Morrell, shared in his presidential keynote address at the annual convention, NCTE is the oldest, most historic literacy organization in this country. This November, our graduate students became a part of NCTE’s history and undoubtedly, its future. After working hard to prepare their presentations under the guidance of their English education professor, Dr. Nicole Sieben, the students arrived at the conference eager to share their work and network with other graduate students, English teachers, and scholars in the field. 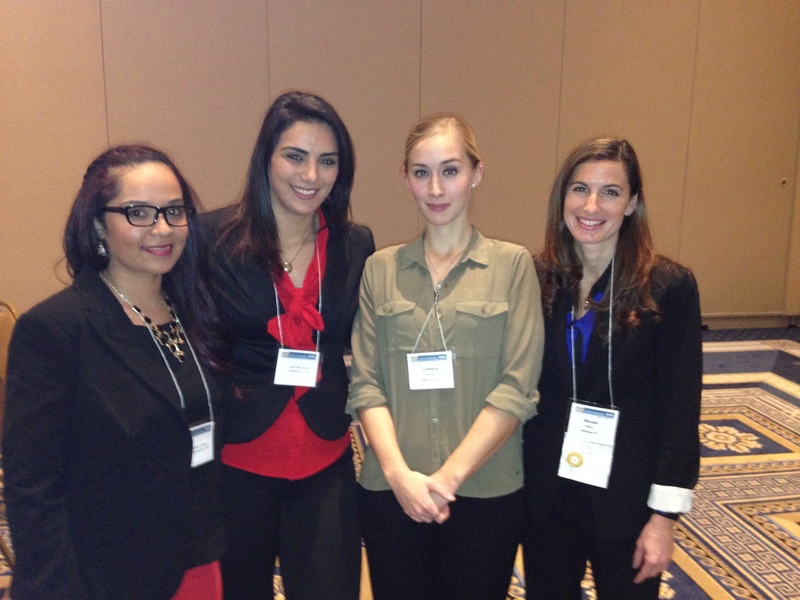 On Saturday, November 22, 2014, SUNY College at Old Westbury English Education graduate students–Griselda Ureña, Lindsey Johnston, and Jennifer Rollo– presented their research projects at the NCTE conference session “The Future is Now: Exploring 21st Century Teaching Ideas with the Next Generation of English Teachers.” Griselda, Lindsey, and Jennifer presented alongside graduate students from 14 other universities across the country to an audience of over 130 attendees. Our English teacher candidates represented the stories of SUNY Old Westbury education students and English majors as well as the stories of the students in the secondary English language arts classrooms in which they are observing. Jennifer Rollo’s presentation titled, “The Search for Identity through Inner Conflict in Hamlet” described the literary significance of this Shakespearean work and provided strategies for teaching the play to secondary school students in engaging ways. Lindsey Johnston’s presentation, “Writing Connections: The Importance of Cross-Curricular Literacy,” detailed the importance of teaching writing across the curriculum in all school subjects in conjunction with teaching writing in English language arts classes. In Griselda Ureña’s presentation, “The Absolutely True Diary of a Part-Time Indian: A Pairing of Young Adult Literature with Canonical Classics to Promote Student Engagement,” Griselda shared strategies for pairing influential works of Young Adult literature with critical canonical texts in order to engage students’ literacy interests, motivations, and fluencies. During their session, the students also had the opportunity to engage in important conversations with other graduate students and notable scholars in English Education whose work they have studied this semester. Throughout the conference, the students attended sessions that explored “the many dimensions of story as the landscape of knowing–story as literary and informational text, story as cross-disciplinary collaborations, story as multiple literacies and genres, story as memory and identity, story as teacher knowledge and research, story as community and culture, story as marginalization, and story as resistance.” As future secondary English language arts teachers, our teacher candidates felt that it was an extremely eye-opening and important conference for all future and current English teachers to attend; it is an influential step in their acculturation process as teachers of English and as life-long learners. As one student noted after the conference, “It’s a place to talk about English and literature and writing where everyone is speaking your language. Everyone there is really interested in what we are doing because they are all doing it too. It’s a really great feeling of community.” Likewise, the NCTE community was impressed with the work that our students are doing and have expressed a hope that our students will participate in future NCTE conventions. To close the convention, NCTE President Ernest Morrell echoed our students’ sentiments. He encouraged all teachers of English to stand collectively as a group for social justice, and he inspired us to walk together to teach critical, activist literacy for and with all students. He reassured us, “It is much easier when you are walking with people. NCTE should be the place to say ‘if you are about literacy and social justice, you don’t have to walk alone.’ And, you do not have to walk alone.” Our SUNY College at Old Westbury students are among those English teachers who are about literacy and social justice, and it is clear they are eager to be a part of the activist literacy movement to which Dr. Morrell refers. Previous Post Announcing the Professor Mary Grabher Poetry Contest!! !